If you ever wondered what's the volume of the Earth, soccer ball or a helium balloon, our sphere volume calculator is here for you. It can help to calculate the volume of the sphere, given the radius or the circumference. 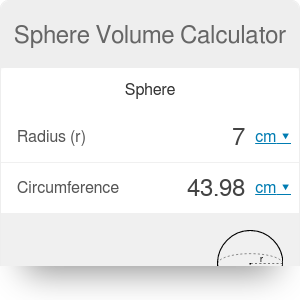 Also, thanks to this calculator you can determine the spherical cap volume or hemisphere volume. Usually, you don't know the radius - but you can measure the circumference of the sphere instead, e.g., using the string or rope. The sphere circumference is the one-dimensional distance around the sphere at its widest point. Do you know what the volume of an official FIFA World Cup soccer ball called size 5 is? Or basketball, size 7? Let's check! Enter the radius of the sphere. For size 5 soccer ball radius should be equal to 4.3-4.5 in, let's take 4.4 in. The sphere volume appeared, as the circumference. They are equal to 357 cu in and 27.6 in. Assume that for the basketball we don't know the radius. Type in the circumference instead. For basketball size 7 the typical one is 29.5 in. The volume of a sphere and radius is displayed, 433.5 cu in and 4.7 in, respectively. Find the height of the cap. For example 7 in. Determine the radius of the base of the cap. Let's say it's equal to 3.1 in. The spherical cap volume appears, as well as the radius of the sphere. They are equal to 287 cu in and 4.2 in for our example. To calculate the volume of the full sphere, use the basic calculator. Enter the radius 4.2 in. Now you know, that fish tank has the volume 287 cu in, in comparison to 310.3 cu in for full sphere volume with the same radius. How to calculate it? Just use the formula for the spherical cap volume with the parameters equal to each other: sphere radius = height of the cap = cap base radius. Also, you can divide the full sphere result by 2 . Sphere Volume Calculator can be embedded on your website to enrich the content you wrote and make it easier for your visitors to understand your message.